Looking for a perfect breakfast? 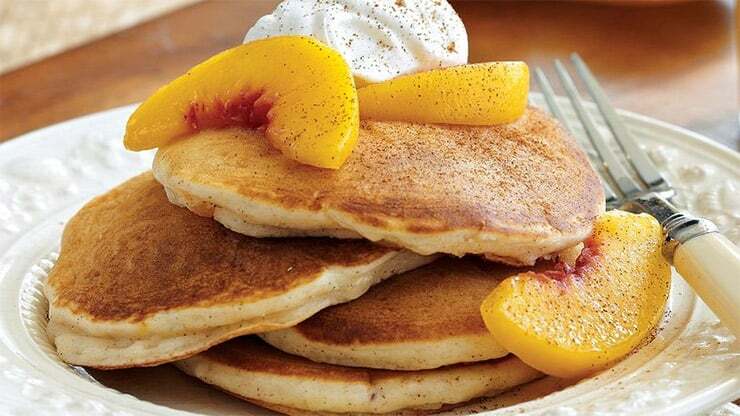 This great pancake mix with a gentle touch of apricots is my favourite, easy to follow breakfast formula. Just a few simple ingredients make this breakfast classic extremely easy to make, which is great for when you’re in a hurry. And the best thing about it – it tastes perfect every time! Blend flour egg, yoghurt, lemon juice in food processor. Pour quarter of mixture into pre-heated non stick pan and cook till lightly golden on each side. Reserve four apricot halves for decoration, puree remaining apricots and liquid with extra yoghurt to make a sauce. To serve pour sauce on each pancake. Top with a reserved apricot half and garnish with mint. Serves 4.